So useless is Johnny English Reborn that it is unnecessary to rehash how the kitschy iconography of the James Bond movies is beyond parody (the same thing could be said about James Bond spoofs, for that matter). Rowan Atkinson’s titular Clouseau clone is recalled from Asian exile to crack a plot to kill the Chinese premier. Director Oliver Parker once cut his teeth adapting Shakespeare and Oscar Wilde for the silver screen. Here, aside from a semi-watchable set piece or two, he foists a steady series of groin kicks, animal gags and reaction shots. Frankly, any actor’s presence in this unoriginal, utterly unfunny rubbish is a sign of their shaky career status – I’m looking at you, Gillian Anderson. As a spy sendup the film is unnecessary; as a comedy it’s the equivalent of being repeatedly kicked in the gonads, which is, not coincidentally, one of its frequent go-to gags. 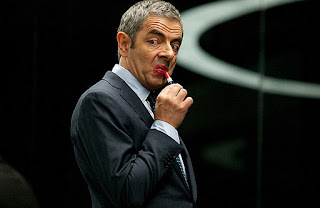 Simply put, Johnny English Reborn should have stayed dead and buried.